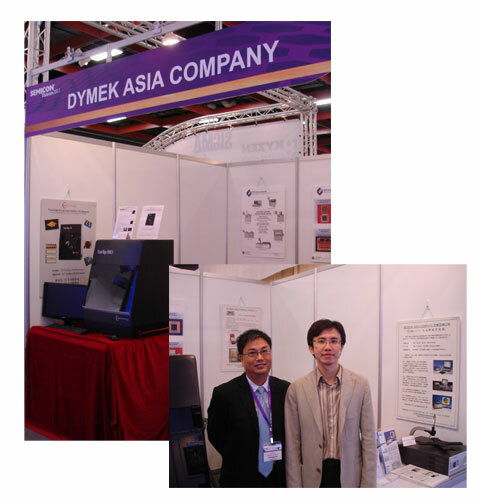 Taipei, Taiwan – Sep, 2011 - Dymek participated in the SEMICON Taiwan 2011 at the Taipei World Trade Center (TWTC) from 7 to 9th Sep, 2011. We exhibited SST product information and Filmetrics thin film measurement tools of model F20 and F50. We received many enquiries from both old and new customers. Programmable Vacuum Solder Reflow Furnace void free, flux free, high yield (99%+) , flexibility for different type of sample materials ( e.g. glass-to-metal package seal, GaAs die with sub-mount …etc.) , controllable moisture level & inert gas inside of hermetic package & MEMS package. Optical Thin Film Thickness Measurement Tool Thickness, refractive index, and extinction coefficients are measured quickly and easily with Filmetrics’ advanced spectrometry systems, enabling thickness measurements of films 10 angstroms to 350 um thick. One of our principals, Okano, also exhibited their Pick-and-Place and Automatic Optical Inspection (AOI) demo tools at the show. Okano was established in 1969 and has rich experience in tailor-made solutions for AOI and automation, with a well-known customer base in the world covering semiconductor, passive components, quartz oscillators and LED industries. As this year’s show becomes yet another recollection, we would like to thank all of our customers and suppliers who are always there to help us make our effort a notable success.